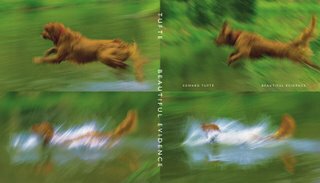 Edward Tufte's newest book is out. I've heard Tufte speak, and I've been through all the books, and I'm not quite sure what all the fuss is about. His fans are almost cultish in their devotion to him, but I find his demeanor and writing to be, well, pretty flatulent. And oh yeah: like the cover? Prints of it can be yours for only $500. Yeesh. Tufte's writing style can be dense, but he can also be subtly wittly ("flattened-out frog suit! "), and he is so smart, so observant, reading him has broadened my ability to see critically.